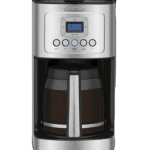 Cuisinart DCC 1200 brew central 12-cup programmable coffeemaker is pack with high tech features that not only let you brew your daily Joe with ease but give you the same quality cup of coffee you can expect from popular coffee bar. This masterpiece has a classic look, with retro styled Flip ON/OFF switch and rotary function knob. In order to brew a great cup of coffee, you need good control of the water(quality and temperature) and coffee beans(quality and freshness of the beans). As 98% of your coffee is water, we want the water to meet the optimal standard for brewing, SCAA standard can be a good guild. 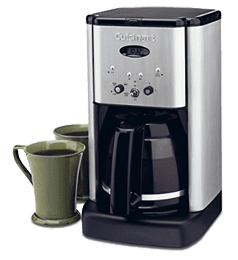 Cuisinart dcc 1200 brew central 12-cup programmable coffeemaker comes with a water filter holder for holding replacement charcoal water filters, capable of removing chlorine, calcium, bad tastes and odors from the water. 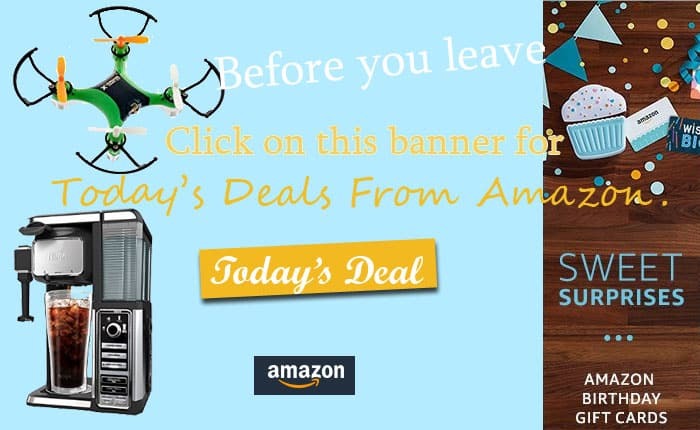 It makes every cup of your coffee fresh and free from unwanted impurities. 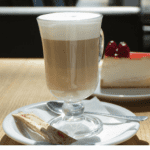 Coffee makers certified by SCAA is very popular among coffee lovers as these coffee brewers need to go through stringent tests and pass with flying colors. Controlling coffee temperature after brew is also very important, Cuisinart introduce the Carafe temperature control feature to maintain the coffee temperature. There is 3 temperature setting of High, Medium and Low, simply by turning the Heater Plate Control Knob to set your desired coffee temperature. Hot water dispensing and passing through coffee ground is via a shower head which is well crafted to evenly distributed the hot water over coffee ground to fully extract the coffee favor and reduce water temperature loss. 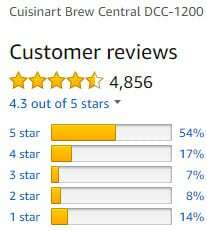 You may experience brewing small pot of coffee with other coffee machine and not satisfied with the water temperature, no in the case of the cuisinart DCC 1200. This coffee brewer equips with a 1-4 cup setting that can serve you piping hot coffee even you only brew a small pot. Cuisinart DCC-1200 includes a permanent coffee ground filter, or you can buy separately if you prefer a paper filter. Coffee ground shouldn’t be too fine as over extraction can occurred and result in bitterness. Too fine the grind can also cloak the filter. On the other side, too coarse the grind results in water passing through the filter too quickly, unable to fully extract the coffee favor and essence. Medium grind works well for this coffee maker. Auto ON function enable you to program the start time of the brew cycle and auto OFF will let you determine when to shut off the coffee maker, time range from 0 to 4 hours. If you cannot wait for a full pot of coffee to be brew, especially when you are preparing 12 cups, Cuisinart DCC 1200 coffee maker has this brew pause function that allow you to pause the brewing process during mid-brew, fill up a cup of coffee and resume the process. Do note that removing the carafe will stop the flow of the coffee but not the brewing, carafe must be placed back on the heating plate within 30 seconds to avoid coffee over flow from the basket. All coffee machines need to be cleaned after some times of use and maintaining of the Cuisinart DCC-1200 coffeemaker is very easy, it even has an inbuilt indicator light to alert you when the DCC 1200 is due for cleaning. If the self clean light flashes when the coffeemaker is turned on, its an indication that the calcium buildup is affecting the functioning of DCC 1200 and the flavor of your coffee. Simply fill up the water reversior with 1/3 option of white vinegar with 2/3 of water and press the self clean button. Run one cycle of fresh cold water through the unit and you are ready for the next brew. 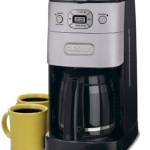 Cuisinart DCC 1200 coffee maker is well liked by many customers. 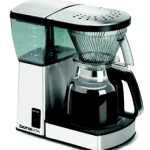 We like this home coffee machine a lot and it is one of the best drip coffee maker in the market. It has an average of 4.3 stars rating. Although the majority customers have positive feedbacks about this product, some are not that please after using it. You can check out what the actual users comment on the DCC 1200 before buying it.